One of the most important job skills every employee, including those on the autism spectrum, must learn is how to greet a customer properly. If employees learn this valuable skill, they will be way ahead of the pack. Their employer will notice and customers will become life-long evangelists. Many employees (and business owners!) fail miserably at this simple task, turning customers off forever and losing them to the competition, or to the online marketplace, often without even realizing it. In my previous life I owned a specialty retail store. I developed an extensive and innovative six-week customer service and sales training program for new employees, where they were introduced to proven techniques and had to pass a test before joining the sales team. The program worked. I watched as confidence – and customer satisfaction and sales – soared. The tenets taught in this first training program provided the basis of my award-winning book Smile: Sell More with Amazing Customer Service. Starting with that all important smile and friendly greeting at the front door, we took our store from a start-up to a beloved award-winning specialty retail business. Known through the Midwest for excellent, friendly customer service and a vast selection of high quality merchandise, we won West Bloomfield’s Most Beautiful Store Award. Through leadership, customer service, and sales training, this store became the leading Midwest dealer for many brands. We didn’t take a single customer for granted, and neither should you. I can tell you one thing for certain: Without that smile and friendly greeting to our customers at the front door, we would have been out of business in the first six months. Greeting customers with a warm smile and friendly “Hello” should be done simply because it’s common courtesy, just as you’d greet a guest in your home. Not to mention that greeting customers properly makes you more money. 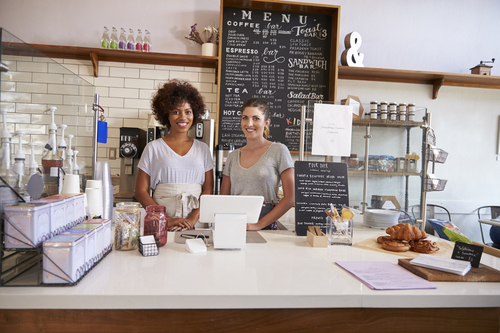 When greeted properly, customers stay, spend money, and become repeat customers. Contrast these customers to the customers you ignore who often leave without making a purchase and will never come back. These lost customers tell others about their poor customer service experience, causing you to lose more customers and money-it’s a vicious cycle. When a customer enters your business or office, greet them promptly and politely – just as you would greet a guest in your home. 1. Smile. Make it a warm, genuine, heartfelt smile. 2. Look your customer in the eye and say “Hello!” Speak in a warm, upbeat, and friendly manner. This may sound basic, but you’d be surprised how many businesses fail to greet their customers properly. According to Malcolm Gladwell, author of Blink, first impressions occur instantaneously or within two seconds. A simple smile and friendly “Hello” are extremely powerful and can mean the difference between a customer spending their money with you (and possibly becoming a customer for life) and walking out the door to spend it with your competition. In The New York Times bestseller Buyology, Martin Lindstrom discusses “The Smile Study”. Its bottom line? A smile from a salesperson leads to more sales. Indifference is one of the biggest reasons people don’t return to a business. Practice this skill until you have mastered it. Role-play the techniques and lesson above with your family, friends or co-workers. A warm smile and friendly “Hello” will make your customers feel welcome and ensure that you always make a great first impression. This will make you feel good too! It’s one powerful way to keep your job and succeed at work. Parts excerpted from Smile: Sell More with Amazing Customer Service-The Essential 60-Minute Crash Course, Copyright © Kirt Manecke. Kirt Manecke is the author of SMILE: Sell More with Amazing Customer Service: The Essential 60-Minute Crash Course. SMILE is the winner of the Mom’s Choice Gold Award honoring excellence, Teachers Choice Award, FOREWORD Reviews Book of the Year Award, and others. Learn more at www.SmiletheBook.com. Kirt Manecke is an award winning author and sales, marketing, and fundraising specialist who’s an expert at delivering amazing customer service that makes people smile. Kirt is passionate about helping teens and adults succeed. He wants to help people with autism and other special needs get and keep a job and live fulfilling lives, which is why he is thrilled to be working with Aspergers101. He hopes his information will make it easier for parents of kids and adults with special needs to make friends and get that job. I use to work in customer service and I would always smile. Even though I smiled, I would still have difficulty with customers who did not understand me which a lot of if was because I would try too hard to please customers. I also would have issues where I was misinterpreted by customers because of my quirky mannerisms which would make me mad and I would start obsessing non stop. I was wondering if I could receive more information on how I could study smiling and get more people to smile back at me? Thanks!